Memphis - Currently, truk and Kath are living in Memphis. A more complete list of trips can be found on the truk.com home page. If this webpage looks old, that's because it is. Australia - truk and Kath lived in Sydney, Australia, from Aug 2001 to Aug 2002, traveling throughout the country during that time. A complete list of their Australia trips can be found on the truk.com home page. Southern Africa - In June and July of 1999, truk and Kath explored southern Africa, starting in Cape Town, moving up the coast along the Garden Route. We toured Jo'berg, gasped from the awesome power of Victoria Falls, and drank ourselves silly in the Stellenbosch region. 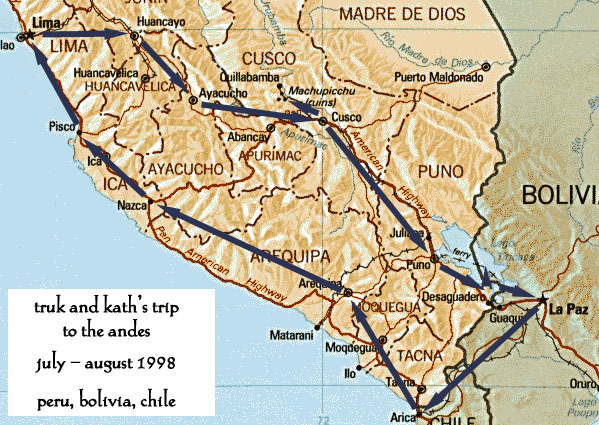 Katherine and I spent most of July and the early part of August trekking around southern Peru and northern Bolivia and Chile. We had a fantastic time and recorded a large portion of the trip in words and pictures. Please click on the link below or the section of the map you are interested in. And, as always, please email us with any suggestions or questions you have. Kath and I would like to especially thank Keith O'Brien for his diligent editing efforts. These shots were taken while on a trans-Asia trip with five friends in the summer of 1995. I did not keep very good travel notes while on the trip, but I am slowing going back and adding some text to provide an explanation for each of the images. The idea behind this trip, other than a return home to the states, was to retrace the ancient silk route across Asia through several countries which had just recently gained independence. Much of this trip hasn't been open for Westerners since before WWI. The trip began in Prague, the Czech Republic, where I had been living for nine months. We traveled by train to Istanbul, took a bus to Trabzon, Turkey, and then onward by bus to Georgia. After a harrowing train trip, we made it to Baku, Azerbaijan, then crossed the Caspian Sea to reach Turkmenistan. A train delivered us out of the Turkmen desert into the arms of Uzbek police, which gladly departed us to Kyrgyzstan. We secured transportation in Bishkek and traveled through the Tourgart Pass into China. In China, we stayed in army barracks at the border, moved on to Kashi and then Urumqi, and took what used to be called the Iron Rooster all the way to Beijing. After seeing the city and the Great Wall to the north of it, we trained down to a still-free Hong Kong. After a short stop in the Philippines, we arrived back in the U.S., landing in San Francisco. I sorta collect money from around the world. I say sorta because I don't really try very hard at it, and my collection is a little less than spectacular. However, I do have some cash from Azerbaijan, China, Poland, Russia, Slovenia, Turkmenistan, Uzbekistan and other places where Charmin has yet to catch on, given the value of the local currency. OK. For those of you still here, we offer a fine platter of pictures from the honeymoon, all fresh and cleaned up, ready for consumption. Unlike the Central Asia pics, these shots do have a corresponding narrative. As I find the time to type it in and put it with the pics, hopefully the pics will start to come to life with great time we had those three weeks. We began in Prague, where I spent a day or so catching up with some friends (Lara Grimes and Lucka Zavodna). Most of the time during the day was spent meandering through the streets, seeing what there was to see, and getting back into the vibe of things. We took an overnight trip to Cesky Krumlov and, a few days later, hopped a train for Istanbul. Thanks to the wonderful Slavs in Yugoslavia, we had to have a visa to pass through on the train. Since we didn't find this out until Friday night in Budapest, we disembarked, tossed our tickets to the wind, and got on the midnight train for Romania. There, we actually had a few hours to stretch our legs and walk around the beautiful city of Bucharest (does satire mean anything to you?). From there, Bulgaria awaited us with open arms and scams galore. After a bus ride to the south and the generosity of a man named John, we made it to a Greek train station that would take us to Alexandropolis. Of course, the only thing to do in Alexandropolis (besides feast on glorious gyros) is leave, so we did. On to the ultimate destination we sailed (ferried actually), to the beautiful island of Samothraki, three hours off the mainland. Samothraki is a mixtures of ancient villages and modern ruins, rock beaches of all types and solitude of one kind. After a short week there, it was back to Alexandropolis and onto a bus to Istanbul. Did the Muslim Disneyland thing there and flew back to Prague a few days later.